How does an EV go? As part of his trial to see if an all-electric vehicle is practical for a family, Paul Smith has taken a closer look at aspects of each vehicle. The first difference you notice when driving an electric car is how responsive it is. In a car with a combustion engine, a gearbox sits between the engine and the wheels to match the wheel speed to the engine’s “sweet spot”. However, with an EV, the motors drive the wheels directly, so there’s no gearbox lag or hunting for gears and the drive is smooth and immediate. But, while the concept is the same, the design of different EVs means they all feel a bit different. The BMW i3 uses 125kW motors to drive the rear wheels, while the Ioniq uses lower-powered 88kW motors for the front wheels, resulting in a notable difference in power. In town, the i3 was fast and responsive – it was quick from a standstill and squirted into gaps in traffic. Efficiency during the test must have suffered as I couldn’t help but accelerate hard at every opportunity, it was so much fun! In contrast, my first impression of the Ioniq wasn’t so good. It had the smoothness I expected, but felt slightly sluggish. But then I explored its drive mode settings. The Ioniq defaults to “Eco” mode where, to maximise fuel efficiency, it reins in acceleration and lightens steering. “Eco” mode made the Ioniq feel like a quiet petrol car. By switching to “Sport” mode (which I ended up doing each time), it drove more like a nippy EV. The i3 defaults to “Comfort” driving mode, offering full power and no eco-compromises. It also has an “Eco” mode, which slightly dulls acceleration and reduces power to the air conditioning. While it’s not as fun to drive, it could be handy if you needed to eke out a few more kilometres to get to the next charging station. Its “Eco Pro” mode takes it further, with acceleration cut back even more, top speed limited, and the a/c turned off. I found “Eco” mode in both cars made highway driving easier, as the accelerator was less sensitive. However, whatever the mode, the direct (gearbox-less) drive and meant acceleration was smooth. Regenerative braking is a feature of EVs. An electric motor can be used to generate and recover energy, so kinetic energy (which is usually wasted as heat in normal braking) is captured in the motor, which slows the car and charges the battery. Driving over the Rimutaka Hill, with an elevation gain (and loss) of more than 600m, the cars used no more than 4% of their battery, as some of the 8-9% consumed on the way up was reclaimed on the way down. Perhaps the best feature of the i3 was “single pedal” driving. Set up with powerful regenerative braking, the i3 could bring itself to a standstill just by the driver lifting off the accelerator. Strong deceleration even triggered the brake lights. Braking took getting used to in the i3, but I was soon driving around hardly touching the brake pedal. The i3 was so easy to drive, in fact, that I found myself paying more attention to everything around me. That could only make it safer. The Ioniq also had regenerative braking. However, unlike the i3, it could be adjusted. On its highest setting, I could create something like the “one-pedal” feel of the i3, though I still had to use the brake pedal to bring the car to a halt. By default, regeneration is set to minimum, making the Ioniq drive more like a combustion engine car and missing much of the battery-recharging benefit. The other big difference in an EV is weight. Batteries are heavy and bulky – usually mounted under the floor between the wheels. But there’s no engine and gearbox lump up front, and the rest of the car is built light to offset the extra battery weight and maximise range. That means weight tends to be more central and low down, so the “ride” and handling of an EV will likely feel different from that of a petrol engine car. The i3 had stiff suspension and a harsh ride. While this made handling fun, it also made the car feel “skittish”. Driving the i3 on an unsealed road was like driving on ice. It felt more “planted” when loaded with passengers. On the positive side, the stiff suspension made cornering roll-free. My kids, usually feeling a little green in the back on particularly winding hills, barely noticed going up and over the Rimutaka Hill in the i3, despite me enjoying myself a little more than usual. The Ioniq ride was comfortable and unexceptional, keeping with other aspects of the car. It was easy to drive on city streets and stable on highways. Driving over the twisting Rimutaka Hill produced a similar sense of fun to the i3, though without the stiffness. The Ioniq took all surfaces, including unsealed roads, in its stride. A quirk of EV weight distribution became apparent on my steep Wellington driveway. With no engine or gearbox up front, the Ioniq has less weight over the front (driven) wheels. On a damp morning, the car struggled for grip up the steepest section, spinning to a halt before finding enough traction. The rear-drive BMW, with more powerful motors, didn’t suffer the same fate. The i3 had a pleasantly un-car-like, luxury lounge-feel. The usual black or grey plastic and leather were notable in their absence. The dashboard felt more like a sideboard, and the deep windscreen made for a light and airy feel, helped by the low centre console and open space between the front footwells. However, there wasn’t much storage for bits and pieces, and the open footwell, while equipped with an elastic strap, allowed things on the passenger side floor to roll under the driver’s feet – not great for safety. The rear was less comfortable. The 2 seats were fine for kids, but a squeeze for adults. Getting in and out was made difficult by the coach doors and, while they were deep (making the rear feel bright and airy), the rear windows were fixed and couldn’t be lowered for ventilation. The i3 felt rather like a 2-seater with a couple of occasional chairs out back. Continuing the easy-transition-from-petrol theme, the Ioniq interior offered few surprises. While well-finished and not unpleasant, the dashboard and centre tunnel appeared a little “heavy” and the overall blackness a bit oppressive. Storage space was good, with cubbies and pockets for as many odds and ends as a family could muster. The front was spacious and the driver’s seat had an “electric adjust with memory” function for multiple drivers. The rear space was comfortable for kids and adults, with good head and legroom. There was a full centre seatbelt for a third rear passenger, but it was a bit of a squeeze fitting 3 adults in. The Ioniq was fitted with heated front seats, rear seats and steering wheel. The idea is it’s more efficient to heat just the human contact points than the entire cabin space – saving battery and maximising range. When cabin heat was needed, the Ioniq has a highly efficient heat pump heater as part of its climate system. While the automatic climate control system in the i3 was good, the heat pump heater and heated front seats were optional extras, adding $1800 to the price. “In-car infotainment” in the i3 is a real surprise and delight. Aside from the usual Bluetooth phone connection (which linked seamlessly to my music and podcast collection on my iPhone) and built-in GPS navigation, the i3 also had its own SIM card with mobile access. This provided live weather and traffic information, whether or not your own phone was connected, and could be used to call the BMW concierge service for assistance with navigation (or life in general?). The navigation system also went further than usual, linking to the charging network and showing a dynamic EV range on the map (“dynamic” because it changed with terrain and driving style). In the Ioniq I pressed every button and even checked the manual, but it turned out it didn’t have built-in GPS navigation. Instead, it relied on an Apple CarPlay or Android Auto connection to a phone to provide mapping and navigation. To enable CarPlay with my iPhone, I had to connect with a USB cable (Android Auto works without a cable, and the Ioniq also has contactless charging for compatible phones). Once connected, I had full access to media on my phone, but I was limited to using Apple Maps for navigation. While it’s unfair to compare the sub-compact i3 or small hatchback Ioniq to a family-friendly station wagon, the sizes of these vehicles reflect limitations in EV technology. To achieve a range of 200km or more with current battery technology, the car’s weight has to be kept low and its shape has to slice efficiently through the air. That means smaller cars. 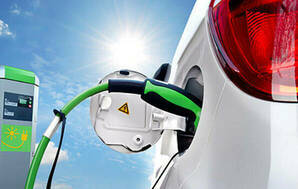 For greater range or bigger cars, more batteries are needed, but that adds weight and means they take longer to charge. It’s a case of diminishing returns. As a result, the current crop of 200km BEVs are small hatchbacks, so it is fair to see how these stack up as a family car as, currently, they are the only realistic BEV option. The i3 was most at home in the city. The go-kart feel, relatively high seating position, small overhangs, and tiny turning circle made driving around the city a breeze. Parking was aided by all-around sensors offering proximity warnings, and a rear-view camera with cross-traffic warnings (a godsend for angle parks). That was even before I played with the self-parking function (which locates a parallel park large enough and manoeuvres the vehicle into place with no driver input). Unlike the i3, the Ioniq is low-slung and doesn’t offer great all-around visibility. I found the rear view annoying, obstructed by a thick horizontal bar that split the tiny rear window. To make that worse, the glass sections were too small to fit a wiper. The Ioniq didn’t self-park like the BMW, but it has a decent reversing camera and sensors, which offers good cross-traffic alerts. The turning circle was large for a small car. Coupled with low-slung visibility that made it tricky to judge where the corners were, it made tight manoeuvres in narrow Wellington streets harder than necessary. The small size of the i3 compromised daily practicality. That became apparent when I couldn’t fit a week’s worth of groceries (6 re-usable bags) in the 260L boot. The i3 has a very high load floor (the motors driving the rear wheels are underneath). 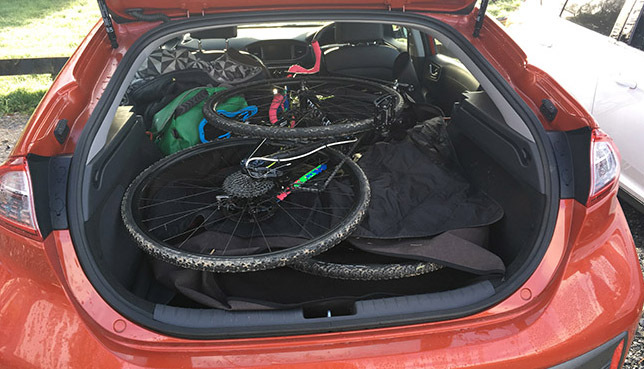 With the rear seats folded (seat backs are split 50:50 and fold to form a flat, but high, load floor), I could just fit an extra-small, adult-sized bike in with its front wheel removed. The coach doors brought a smile to the faces of everyone who saw them. But after using them a few times, my smile had turned into a grimace. The small rear doors hinge at the back and latch to the front doors. Needing to open the front door to get out of the back seats was inconvenient, as I discovered when dropping kids at school. With no front-seat passenger, there was no easy way to open the front door. I also realised how often I threw something on the back seat. In the i3, that meant opening the front door, then the rear, then remembering to shut the rear door before closing the front. Phew. In contrast, the Ioniq felt exactly like a regular small 5-seat hatchback. It has 4 normal doors and 5 seatbelts. Used daily, I never found it lacking in space or practicality – it managed all my daily tasks with no fuss. Rear passengers could come and go through their own doors. The 350L boot swallowed a week’s worth of groceries, and I could load 2 adult-sized bikes inside (with the front wheels removed). The rear seats split 60:40 and the seatbacks fold – though they don’t form a totally flat load floor.